Everyone knows what makes a good school--good teachers and small classes. 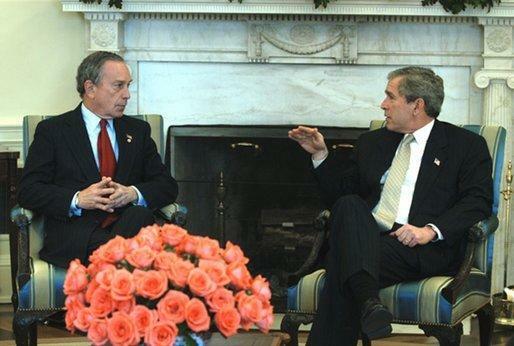 Your boss, Mayor Bloomberg, used to talk a lot about the need for good teachers. In fact, he went and took the LAST test, passed easily, and declared any high school graduate ought to be able to pass it. I was encouraged by a mayor who seemed to seek excellence, rather than expedience, in hiring teachers for the city's kids. Shortly thereafter, however, he sent you to Albany to request the right not only to retain teachers who'd failed that test, often multiple times, but also to ask for the right to hire more teachers who hadn't met minimum state requirements. Your request was granted, and now, thanks to you, New York City has the least qualified staff in the entire state. The UFT, which you condemn at every turn, has long supported high standards for teachers. I would not want an unqualified teacher instructing my child. Would you like one for yours? How on earth can you find them suitable for NYC's 1.1 million kids? As for class size, sir, Mayor Bloomberg single-handedly prevented a referendum on lower class size from reaching New York City voters. You proposed a contract with no limits on class size whatsoever. Last year, overcrowded classes were everywhere. I personally knew people teaching them the entire semester. You dismissed this in the press as UFT propaganda. Recently, and thankfully, the court case on these issues was resolved, decreeing New York children need and deserve good teachers and small classes. It was finally decided that we would get funding, and that the city could shoulder some of the cost for this. The group that brought the suit suggested the city pay 25%. Governor Pataki suggested 40%. Thus far, Mayor Bloomberg has offered precisely nothing, and a spokesman suggested, if compelled to pay, the Mayor would reply “No, thank you” to the suit in its entirety. The actions of this administration suggest that you support neither good teachers nor small classes. I will spare you, for now, my comments on the unconscionable overcrowding of our high schools, mine included. In return, kindly spare us notes like this year's welcome letter, the one that appeared in our mailboxes before the Christmas break, or the one you published in the UFT paper. We've seen you interviewed, we've read your comments, and we've read your 8 page contract. We all know precisely how you feel about us. We are the city's teachers. When you vilify the UFT, you vilify every one of us. Show us a little respect. When you're really ready, we'll gladly work with you to improve education. PS If you really want good teachers, I suggest you scrap the PERB proposals in their entirety and simply offer us a raise. Contrary to what you may have read in the Daily News, 50% of our new teachers don't quit within 5 years because the working conditions are too easy and the pay too high. …back in 1995 under Mayor Rudy Giuliani, teachers were relieved of hallway and lunchroom patrols. That job was properly assigned to school aides. Now Klein and Bloomberg want to return to the old system. They hope to save money by cutting the jobs of hundreds of school aides. Using teachers as hallway monitors does absolutely nothing to improve education. 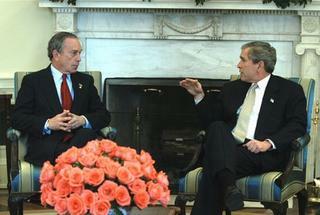 So much for “Children First.” With Bloomberg, it’s always about money. Him, I understand. But how does the UFT Executive Board sleep at night, after selling us out, and for so little, on Bloomie's "Roadmap to a Sixth Teaching Period?" …to The Wonkster, over at the Gotham Gazette, for his kind mention of this blog. Well, the coverages are out, but you'll still be doing lunchroom duty, ten minutes, and three days extra. Weingarten will boast of the tough negotiations, but the deal is still not worth the money. You'll be teaching 5 classes plus a sixth 30 minute "small-group instruction" which will become a sixth class on the next piece of crap contract the UFT agrees to. And you'll be approving the precedent that you can never get a raise without financing it yourself. That's very short-sighted. Don't let them ram this down our throats. If they don't care, let's show them we do. Guidance counselor extraordinaire. Has me come to meetings and translate for him because he can’t be bothered learning Spanish. Sits, smirking, tells me the kids are hopeless, and expects me to report that to their mothers. And he’s just as good when you report a problem. In my ESL 4 class is one kid who speaks very well, but won’t fill out a book receipt, a Delaney card, or a test paper. I take him into the hall and write words on a piece of paper. HOUSE. MOTHER. TREE. The kid, in NYC schools for years, can’t read, and nobody seems to have noticed. Who’s his counselor? Mr. Fish. I take the kid down and say oh my God, the kid can’t read. I call his mother, who knows and asks me if I can get him into a program. Fish says he needs to find out if the kid can read in his first language, which has the same alphabet as English. I bring the kid to the language teacher, who briefly tests him and agrees—the kid can’t read. I walk into Fish’s office three days later, where a female colleague (I guess) is giving him a back massage. I ask what’s up with the kid. Fish doesn’t open his eyes, doesn’t move, doesn’t look at the papers on his desk or check his computer, finally says he doesn’t remember. I go to the head of guidance, who’s suitably horrified. Good. Days later, I get called into the principal’s office, where he demands repeatedly to know who was giving Fish that massage. I have no idea. The kid stops coming to school that very day, and an AP I know tells me NYC has no programs for illiterate high school kids anyway. Gee whiz. Assorted Stuff points to a study in the Baltimore Sun showing Edison Schools cost more than their public school counterparts. Not only that, but while Edison's made progress, local public schools have made even more. And there I was, thinking every untested right-wing notion that came down the pike was better than the system we've used to keep our paisanos educated the last few hundred years. Maybe someone oughta tell Klein and Bloomberg. If I only could write, I'd write a letter to the mayor, if he only could read. Chancellor Klein came into town, guns blazing, promising to bring great improvements to the New York City school system. Soon thereafter, he went to Albany, hat in hand, and persuaded the powers that be to allow him retain teachers who failed basic skills exams, and hire 3,000 more uncertified teachers. Later, he expressed much righteous indignation over teacher quality. Apparently, the Chancellor did not see that as inevitable in a system that scours the universe to attract the lowest common denominator, fails even at that, so sets the standard even lower. New York State expects kids who came from Korea three months ago to pass a grueling (for them) two-day writing test called the English Regents. Chancellor Klein sees fit to employ teachers who’d fail not only that test, but also a far easier one called the LAST test, which supposedly measures teacher quality. Many will argue that teacher certification in itself does not guarantee a good teacher. That’s certainly true. On the other hand, the inability to pass a basic competency test is a strong indicator that a person is unfit to teach children. Such a person would not be granted an interview anywhere but NYC. That’s a good thing, because interviews can be tough. I faced the NYC Board of Examiners for oral interviews (for two different licenses) when the city maintained the highest standard in the State. Their written exams, unlike those current candidates manage to fail scores of times, were no walk in the park either. If you wish to work in Burger King, the manager will want to have some sort of conversation with you. If the manager determines you to be a drooling, insane lunatic, your employment prospects dim considerably. However, if you visit the Department of Education, wave a diploma, breathe, and meet the very lowest standard in New York State, they will indeed send you out as a teacher. If you’re a Spanish teacher who doesn’t speak Spanish, come to NYC. They won’t nitpick about your substandard personal hygiene. If you’re a Chinese teacher who hates everyone from the mainland, and you regularly announce this to anyone within earshot, this is the place for you. If you don’t speak any recognizable language, this is the place to teach language. The DOE won’t raise an eyebrow if you wander around the school in dark glasses talking to yourself. Nor will they make a fuss about your propensity to take off your shirt and beat your chest like Tarzan in the middle of a lesson. And why should they? They can always blame the UFT. My ex-colleague, who both speaks and teaches Spanish, recently found employment in Nassau. He had to go through multi-level interviews and give a sample lesson before he was hired. That’s the least we should do before hiring someone to teach. If we want to set high standards for our kids, we’d better set far higher standards for those we assign to lead them. I once believed that Mayor Bloomberg, in stark contrast to his predecessor, wished to bring real positive change to New York City schools. Unfortunately, he and the Chancellor, despite their much-ballyhooed good intentions, reverted to the exact practices that transformed NYC from the State’s best school system to one of its worst. They did this for one reason, and one reason only—to continue the city’s long tradition of defying the law of supply and demand by settling for virtually anyone who could fill one of its ancient wooden chairs. Now they fight tooth and nail over the possibility of granting teachers a raise that keeps up with the cost of living. Why? They simply don’t give a damn who teaches the kids of this city. Today, the Executive Board of the UFT voted to accept the PERB recommendation as the basis for a new contract. High school teachers had better be prepared to teach five classes, do one lunchroom or potty patrol, (or whatever the principal deems you fit for), a dozen free coverages, and one “small group” instruction. That will make them the most overworked teachers in the state, and even with the increase, still the most underpaid. And don’t forget, with the UFT’s repeated attitude of “We’ll take whatever the hell we can get, and worry about it some other time,” it doesn’t take a rocket scientist to figure the next contract will simply contain another ten minutes, and six full classes. At least they’ll have the satisfaction of knowing they’ll work twice as hard to not get it. Let's buy Randi Weingarten a megaphone, have her stand with us outside of City Hall and demand Mayor Moneybags come out and negotiate. He’s been ducking us for two years, then complaining to the press the union should be at the bargaining table. Let’s show him for the hypocritical liar he is. Let’s make every Friday Black Friday and let the whole city see 100,000 teachers dressed in black, over and over again till we get a fair contract. Let’s hound Bloomberg and Klein at every press stop. Let’s make their lives miserable. And let’s do it now, during the mayoral campaign! Then, if it gets that far, vote no as well. The New York Times reports that PERB's fact-finding panel recommended an 11%increase for NYC teachers over a three year period. In return for that, teachers would work an extra 10 minutes a day, and certain seniority transfer rules would be curtailed. The ten minutes would be added to the twenty they snookered us into taking on the last contract, and we'd do"small group instruction" daily for thirty minutes. It doesn't take any wild stretch of imagination to envision another 10 minutes in the next contract, and a sixth class for high school teachers. In fact, the thirty minute "small group instruction" already sounds like one. In case that's not enough, Bloomberg gets 3 days extra for "development", and 12 unpaid coverages from high school teachers, along with the right to send you to do "administrative duties." It is pure crap, produced by cynics who neither give a damn who teaches NYC's children, nor value those who do. Bear in mind, this increase is still not a raise. It's a terrible deal, and a worse precedent. The extra 10 minutes is about 2.5% of the day. The extra 3 days is another 1.5%. If you subtract that, as you should, it comes to 7% over three years. Then, subtract all of Bloomberg's additional goodies, like your sixth "small group" class, your 10 extra free coverages, and your curtailed rights,and you're left with even less than he gave the idiots at DC37. Remember, if you work at Burger King, you get paid 10% more if your hours increase 10%. So it's not a raise. God help me, I'm going to polish up the old resume now. I just started my 5th year and if this is how they're going to treat teachers in NYC, I may as well make the move to the suburbs now. It's a shame too. I really like the kids I teach in my high school. I like working with an urban population in particular. But I refuse to be treated like a schmuck on wheels, which is how Bloomberg and the PERB panel is treating the teachers of NYC. ...to Ms. Frizzle for my unexpected inclusion in the Carnival of Education! You can find a brand new edition of The Advocate Weekly, painstakingly put together by Joe Thomas, of one of my favorite blogs, Shut Up and Teach. Under the beneficent guidance of Chancellor Klein, we're making rapid progress in New York City. For example, the last coal furnace was discarded over a year ago. Not only that, but I've heard some schools now have classroom phones that are genuinely functional. Most impressive in this electronic age is that many classrooms have actual internet connection ports. Our school, for example, is completely wired for the internet. I sometimes point out to my students where the outlets are located.Regrettably, this often fails to impress them, since none of our rooms actually contain computers. What makes me such an expert? Well, I don't like to brag, but I was once assigned to teach a word processing class. When I got there, despite summoning all my powers and abilities to repair them, only one of the ancient pre-XT computers would function. This was probably just as well, because neither I nor any of the kids were able to master its arcane word processing program. By the second day, that computer was down as well. I spent the rest of the term helping the kids with their homework. I promised that anyone who attended regularly without causing any major problems would receive a grade of 100%.One kid cut the class on a regular basis, and complained endlessly when I failed him. Everyone else left happy and, being kids, they probably all knew more about computers than I ever would anyway. It’s an interesting question, posed by Eduwonk, and certainly the answer’s been the goal of NYC for a long time. While various NY mayors pondered this great mystery, its school system went from one of the world’s very best to what it's been for the past thirty years or so. The city has tried 800 numbers, ads on buses and subway trains, recruiting from foreign countries, including Spain, Austria, and Jamaica, job fairs, and notoriously lowering the standards held by the rest of the state. Perhaps the highly diminished status and quality of the school system is mere coincidence. Perhaps it just happened to be one of the best when it paid the most, and it just happens to be what it is now by chance, having no relationship whatsoever to the fact it pays the lowest wages in the area. In any case, there are a few questions I’d like the answer to before I respond. First, aside from making rent or mortgage payments, how can teachers avoid living in the park? Aside from buying gas, how can we get our cars to reach their destinations? Aside from handing money to various cashiers, how can we acquire things to satisfy our capricious desires (food, clothing, medicine, and so forth)? Well, you get the idea. ought to be required reading for anyone interested in what's really going on in American public schools. Here's a great post about him and this morning's NYT interview from An Old Soul. Thanks to Joe at Shut Up and Teach for the heads-up, and also for his kind mentions in the Advocate Weekly and elsewhere. It appears that the money has been moved in the president’s budget to handle homeland security and the war in Iraq, and I suppose that’s the price we pay. Nobody locally is happy that the levees can’t be finished, and we are doing everything we can to make the case that this is a security issue for us. Above you see Mayor Mike and GW discussing the vital importance of taxpayer funded, billionaire-owned sports stadiums and budget-busting tax breaks for needy individuals making over 300K per year. Mike and George choose not to fritter away valuable time on crazy ideas like funding the levees that could have averted disaster in New Orleans, rising gas prices, lower class sizes, and hiring high-quality public school teachers. They don't live in New Orleans, taxpayers gas up their limos, and their kids have never attend public schools, but they'll doubtless find other means to express their deep concern. 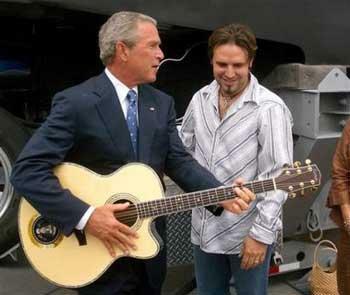 For example, here's President Bush just yesterday, apparently hard at work composing an epic Woody Guthrie-style folk song about the flood. Also, he gave a speech.